Little Snake River Valley School senior Cole Gourlay is brought down by Sterling Baker (44) of Dubois High School during the Wyoming 6-man state championship game. Friday at War Memorial Stadium in Laramie, Wyo. 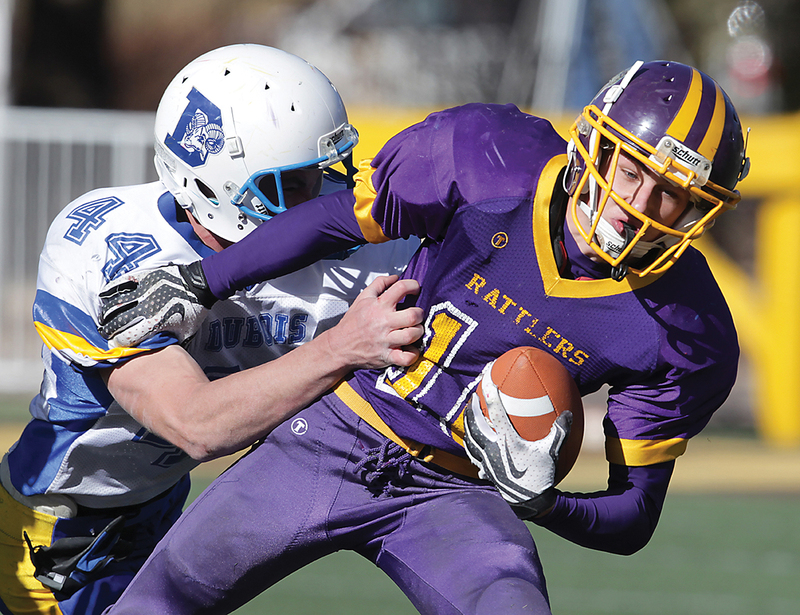 The Snake River Rattlers were going for three straight titles, but Dubois won the game, 54-30. Dubois made sure the Snake River Dynasty would not keep going. The 6-man football team from Little Snake River Valley School had a gangbusters start, but could not hang on short-handed against Dubois in the Wyoming 6-man state championship. The Rams (11-0) beat the Rattlers (9-2) in the second week of the season, 43-36, to put an end to LSRV’s 22-game winning streak. But the Rattlers rolled the rest of the season and looked to get revenge and keep their streak of state titles alive. The Dubois defense would prove to be too tough in a 54-30 loss for Snake River, as Dubois won its first ever state title in football Friday at War Memorial Stadium in Laramie, Wyo. It didn’t look like defense would be a factor in the game early. In the first 47 seconds, each team kicked onside twice and three touchdowns were scored, giving Dubois a 12-8 lead. The Rattlers would retake the lead on a 33-yard run from Cole Gourlay, then extend it to 24-12 on a touchdown pass from Grayson Lee to Manny Quinteros with 5:55 left in the first quarter. LSRV coach Mike Bates knew a good start would be important. Lee, who is not normally a QB for the Rattlers, was called upon to be part of a quarterback-by-committee with sophomore Justin Filip and Quinteros. The normal quarterback, senior Zach Filip, was suspended for the game along with two other players due to a team discipline rule. “We had to adjust to a new offense and did well the first half, but they made the right adjustments going into the second half and we couldn’t answer it,” Bates said. After three scores in less in three minutes of the first quarter, Snake River’s offense came to a screeching halt. The Dubois defense forced several consecutive punts and got another touchdown to close within four at halftime. The end of the second quarter and entirety of the third were owned by the Rams and their ball carriers, Sterling Baker and Jesse Hawk. In a four-TD third quarter, Dubois opened up a 48-24 lead with two touchdowns each from Hawk and Baker. Baker, a 5-11 junior, was especially tough, running for 301 yards on 19 carries. Bates said his team just couldn’t quite corral Baker the way it needed to. The game ended an unprecedented run of state championships for Snake Rivers boys sports teams stretching back to 2010. But Bates still praised his players’ effort from the entire season.